Most of us use maps to help us know where we’re going. As a journalist, I’m just as intrigued by maps that tell us where we’ve been, who we are, what we’re made of and how we treat each other. 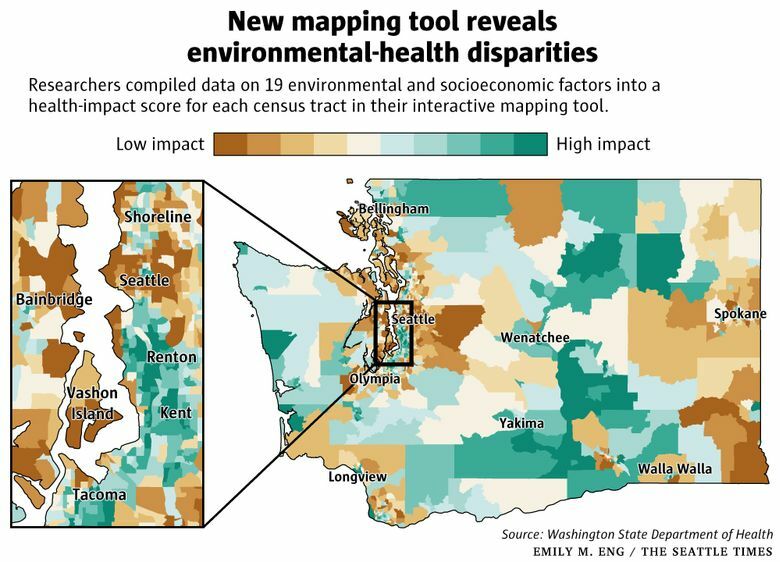 So I was especially interested in last week’s unveiling of an online, interactive map of Washington state that lets users see, for the first time, how their communities rank for environmental-health hazards like diesel emissions, potential lead exposure and proximity to toxic waste. The Washington Environmental Health Disparities Map doesn’t just show these risk factors. It also breaks down socioeconomic characteristics for this state’s 1,458 U.S. census tracts. And it lets you overlay the environmental data with the social data to create maps that reveal where people are most and least at-risk for health issues. View the Washington Environmental Health Disparities Map. It’s available to the public and free to use. This new tool is impressive, the culmination of two years of work by the statewide environmental-justice coalition Front and Centered, state agencies and a research team led by University of Washington doctoral student Esther Min, along with guidance gleaned from community listening sessions around the state, including with tribes, farmworkers and the elderly, all of whom face greater health risks from pollution. I wish I could say that you should be surprised by some of the findings. Instead, the map validates concerns and suspected disparities that people in environmentally distressed areas — from urban Seattle to the orchards and reservations of Eastern Washington — have been talking about for decades. These interactive maps offer concrete evidence of the gap between wealthier and whiter census tracts and ones with more people of color, immigrants and poor or working-class households, which are often located nearer to industrial zones, polluted waterways, high-traffic roads and neglected utility infrastructure. The latter tracts also tend to lack enough affordable, well-maintained housing and good access to health-care facilities. You should play around with the map and the different rankings yourselves — and even search for your own legislative district, Zip code or exact location — but I’ll give one example of the contrasts you’ll find. On the map, I highlighted census tract 011002, an area along Interstate 5 just east of Boeing Field in South Seattle. The population is 58 percent Asian, 25 percent black and 5 percent Hispanic. It ranks 10, on a scale where 1 is the lowest relative risk and 10 the highest, as an area affected by high poverty levels and unaffordable housing. It ranks 10 for proximity to potentially hazardous, federal Superfund sites and 8 for possible harm from wastewater discharge. The tract ranks 9 as an area where socioeconomic factors make people more vulnerable to environmental-health risks. To be sure, the map reveals that many areas in whiter North Seattle experience high levels of risk in some the categories delineated on the map. But when I click on the census tract 002700 on the northern border of Green Lake, for example, I see that this area, which is 80 percent white and more middle class, only ranks 2 as an area in which socioeconomic factors might contribute to those vulnerabilities. That could mean, among other things, that people by Green Lake would be better able to resolve environmental-health issues, or have the means to move, compared to people in more economically distressed or neglected areas. Generally speaking, areas from South Seattle to Tacoma, and in rural areas of Eastern Washington with high Hispanic populations such as around Yakima and the Tri-Cities, appear to have greater exposure to environmental dangers, the researchers say. There’s a lot of nuance in this map, and I’m reluctant to assign causes for disparities using this information alone. Also, both the researchers and officials involved with creating it warn that it should be used as just one tool in making public policy that better addresses the needs of individual communities. There’s a prompt on the map’s legend to give feedback and make suggestions, something the team behind it highly encourages. But there’s no denying the map’s potential to help us pinpoint areas of concern — at an amazingly granular level. I tend to write about justice in broad terms but as I’ve also suggested, injustice is particular. It doesn’t always look the same from one oppressed community, economic group or geographic area to another. We live in a region where environmental concern — for our water, our trees, our air and the region’s wildlife — is almost second-nature, no pun intended. But where people live, whether it’s in urban or rural communities, can also have a huge influence on their sense of, and access to, fairness and justice. This new map points the way toward a new understanding of how our lived environment can both harm and enhance our social landscape, especially at a time when the rising cost of living is forcing people at the middle and lower end of the economic spectrum to make tougher choices about where to put down roots. And it shows us how good data, as a tool to help craft refined policies and set effective funding priorities, can help vulnerable people coexist more successfully with the world around them.